Every home-owner wishes to have a pool that has a picture perfect frame. The only way to achieve it is with proper pool landscaping around it. Without it, the pool will just look plain and boring. Have a picture-perfect swimming pool installation with our pool landscaping ideas. These can elevate the visual as well as the monetary appeal of your home. 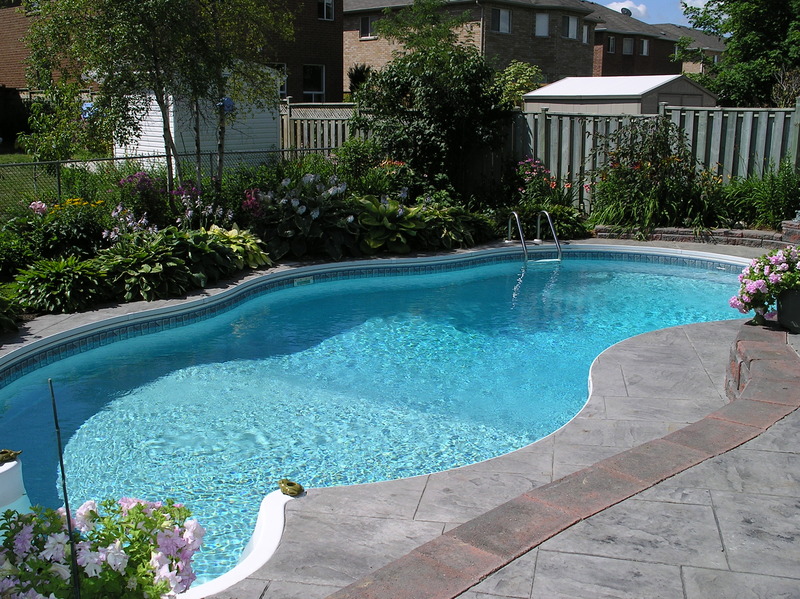 Here are a few essential aspects of pool landscaping that you must consider! If you are installing a pool at home, you certainly would wish to have a more private experience. Pool planting helps you achieve this. There are many plants that can help you have a private experience while elevating the overall appeal of the pool design. This is a great way to put up walls without the use of concrete. Want to know how you can plant for more privacy? Read our blog on ‘Top Pool Landscaping Ideas for More Privacy’. It can help you to know how you can achieve green walls around your pool to enjoy your private pool time. Natural stones are not only costly but difficult to install. Due to this, most of the pool and landscape constructors choose Artificial stones to work with. These stones have a wide range of option and are highly adaptable when placed on site. However, you need to pay close attention when placing these rocks to create a realistic experience and a strong foliage background with high contrast. Isn’t the sound of cascading waters very calming? Install your cascading waters at home with different water features in the swimming pool. Many of the exotic pool landscaping ideas have these water features to make them distinctive from the ordinary. Make sure that these water features are visible from the outdoors of your home as they can make your home have a favourable image. A spa is a passive space to the bigger swimming pool installation. With a place like Toronto, it is now inevitable to imagine any pool landscaping ideas without the spa. Not only it is used for recreational purpose but it also has great health benefits. Many like to sit and unwind while relieving their daily stress. For this, you can install proper pool planting and fences to let everything be private. Greenscapes are beautiful until you need to walk through them and enter inside the pool. The mud and dirt could make your pool water dirty. Even though you are in complete awe of the greenery, you need to have a little hardscape around the pool to keep the swimming pool clean from dirt and debris. Your hardscaping options depend upon your budget. Choose and merge different hardscape pallets to let your pool landscaping design have a better pay off on your investment. If you are planning to install a pool that can enable to let you host some great house parties then you need to consider installing a shade near to the pool. It can be freestanding or attached to your home, depending upon the style you wish to have. You can choose arbours, solid roofing, gazebo or outdoor kitchens, the options are just endless. Pool lightings can make all the difference. They can make your swimming pool design stand out and make your pool accessible even at night. There are many natural and artificial lighting solutions towards having a ‘lit’ pool experience. Always choose LED lights over other halogen lights. These are cost-effective and have versatile options in terms of style, colour and designs. Also, if you are going to have underwater pool lights, you need to plan ahead as they cannot be installed after the pool construction is over. Have these amazing Pool Landscaping Ideas for your Home! Select a pool constructor who can incorporate these elements while designing your pool. If you do not know how to find a pool builder who also offers these services, check out their website and look into their gallery and what kind of work have they performed on their site. We, at Land-con, have over 20 years of experience in creating a cohesive backyard landscape designs. Call us at 416.504.5263 and ask for a free consultation. Get in touch today!